I’ve put a lot of thought into where my food comes from. I have written past blogs regarding eating seasonally, animal husbandry, ethical animal slaughter and the non-wasteful, nose-to-tail approach to cooking and eating meat. I have even written about vegetarianism on my old blog. I am not afraid to approach controversial food topics. Among my food heroes is Hugh Fearnley-Whittingstall, a veritable pioneer for this modern and ethical approach to food. I may not be evangelical about locavorism (we use imported lemons and olive oil and there is currently a Morrocan octopus on the menu), and not everything we serve is guaranteed to be organic (although a lot is), but we raise the bar—-considerably I think. Now that I a own a restaurant, I suppose the instinct is to tread carefully lest I offend a customer or potential customer with food politics. I honestly don’t believe our stomachs should have anything to do with politics, but some people may interpret it as such. There is always a danger there. However, I should, and likely will, stand strong behind my food values. These values have been carried over into the kitchen of my restaurant, and I dare say, the results speak for themselves: our food tastes good, our ingredients are sourced as locally and ethically as possible, our cooking makes a smaller foot print on the planet because of where we buy our ingredients and how we treat them. There is no shame in that. Like any topic, there are a lot sides to the story. To bring things back to the Beech Tree, we don’t typically serve wild game because of the Byzantium food laws involved. We have served rabbit before (ethically farmed) and we have recently acquired some wild caught hare, procured from a Quebecois company called Societe Original, but for the most part, you wont see a lot of wild game on our menu (this may change over time). I have served rabbit, venison, duck and other ‘farmed-wild’ animals to my family in the past. I practice nose-to-tail cooking in my own kitchen as well. For example, last time I braised a rabbit, my wife and I enjoyed the chef’s perk of sauteed rabbit kidney with garlic and jalapeno on a triscuit (pictured below). All this is to say, I believe that any hunting that involves wildlife conservation, quick and painless dispatching of the animal and a nose-to-tail approach to the carcass is perfectly ethical and acceptable. I felt distinctly like this article might have been intended for me. City dweller? Check. Never hunted before? Check. Have a food-related interest? Check. My very first hunting magazine, and here was this article, as if written by a sage village elder contemplating what to do with this new rabble of outsiders running rampant in his sacred domain. The first few lines were perturbing: “I welcome the support of these urban neo-hunters, but I have nagging doubts about their motivation, that they won’t one day clash with ours, pitting yet another hostile force against the traditional hunter“. George Greunfeld, contributing field editor for Outdoor Canada wrote the piece. His understanding of the hipster is fanciful, “dressed in dumpster treasures, with hair in dreadlocks, tattoos swirling purpler and green, and rings dangling from places never meant to be pierced – [they] are chasing down wildlife to feed a faddist Paleolithic diet. And here I was worrying that I was overtly political about such issues. He continues on by claiming that his hunting license is not a food voucher and that he does not hunt to eat (although he does eat what he hunts). 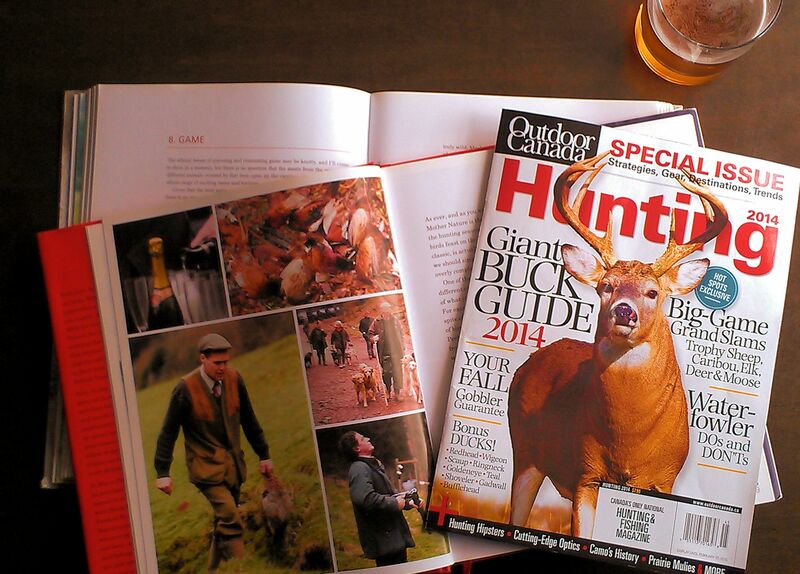 Moreover, on the cover of the magazine, the article’s abbreviated title is “Hunting Hipsters”. An ominous double entendre? Okay, I’m being a bit harsh. I get it. There is a community of folks that have been hunting since they were kids. It is, indeed, a rural tradition that goes back, well, to our very beginning as a species. They’ve likely been defending themselves from blow-horn-toting hippies and animal rights activists for decades. I get their defensiveness. But I am no angry hippy. I think what these hunters are doing, when done right, is enlightening. They have a different relationship with their food then us non-hunters. They look the animal in the eye that they will ultimately eat. Not only is this, to me, a strong moral position to be in, it is also totally badass. Divisiveness is simply not necessary. I think we are becoming a lot more sophisticated in our views on food and that we are starting to think about game in new ways. Some people use the word ‘foodie’, which I hate, but for lack of a better description, there is indeed a renaissance in North America regarding the way we think about and approach food and cooking – it is only natural that eventually hunting would end up on our radar. In the end, Greunfeld admits to meeting a few of these so-called hipsters and they were not the pierced and inked nasties he thought they might be. They were thoughtful and interested in learning about hunting, as am I. I intend to further explore the idea of hunting and would like to bring along my kitchen staff for the experience. I think it would be beneficial to anyone who cooks for a living to get up close and personal with the living flesh that ultimately ends up in their pot. It would be a humbling experience, I suspect. I am looking forward to writing about it. Maybe I will even drag a film crew along to capture the moment. Anyway, I think that’s all I am going to say about that. This blog is really about food and drink and hospitality, but every once in a while, I suppose it can also be my soapbox, which at this moment, I am climbing down from, satisfied that I made my point.